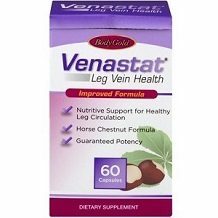 Today we review Body Gold Venastat Leg Vein Health. This all natural formula helps provide the support your body needs to improve the circulation in your legs. Better circulation means less tired feeling and better health of your leg veins. The main ingredient in this supplement is Horse Chestnut extract, which has been standardized to 16.7%. While this percentage is within the clinically studied range, it is at the lower end of what is needed for effectiveness. 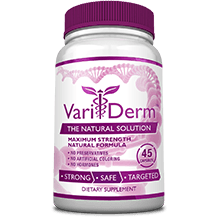 Research shows that this extract should be within the 16-20% range, showing that while this supplement may be effective, it may not be as effective as other products. Additionally, many other supplements combine the power of Horse Chestnut with other nutrients, like Witch Hazel and Disperomin to help with the needed anti-inflammatory effects. One pill should be taken every twelve hours, resulting in an intake of two pills per day. Each dose should be taken whole with a glass of water before meals. This supplement needs to be taken continuously for four weeks in order to see results. If you are pregnant, nursing, or on any other medications, you should first consult with a healthcare physician before beginning this supplement. This supplement could cause nausea or other stomach irritation after taking the capsule. Each bottle contains 60 capsules, or a 30 day supply, and costs only $9.80. For purchases over $35, your order will be eligible for free 2 day shipping. Additionally, this supplement is available in store as well as online. While this very low price is very enticing, it is important to remember that the supplement has a slightly lower percentage of Horse Chestnut and does not include any other nutrients to help your leg pain. If you find yourself unhappy with your purchase, you can return this supplement both in store or through mail. If you send it back with post, you are responsible to pay for the return shipping. The item must be returned in the original manufacturer’s packaging, and it is unclear if you are able to return opened bottles or not. Lastly, you only have 90 days to make your return. There are a few things we liked about Body Gold Venastat Leg Vein Health. This manufacturer is open about the possible side effects of this product, which shows they are open about their product. Also, the price was quite low when compared to other similar supplements. Unfortunately, we had many concerns about this product. First of all, while the percentage of Horse Chestnut used is within the clinically studied range, it is on the low end of this range, which could make this product less effective. There were also no additional ingredients to help supplement these capsules. Lastly, the return policy for this company is unclear, and it is not fully stated whether or not you can return opened bottles. For these reasons, we cannot recommend this supplement to help you heal your varicose veins.